If the race is cancelled, will I receive a refund? Waikiki Roughwater Swim does not provide refunds for swim event cancellation or entry withdrawals. 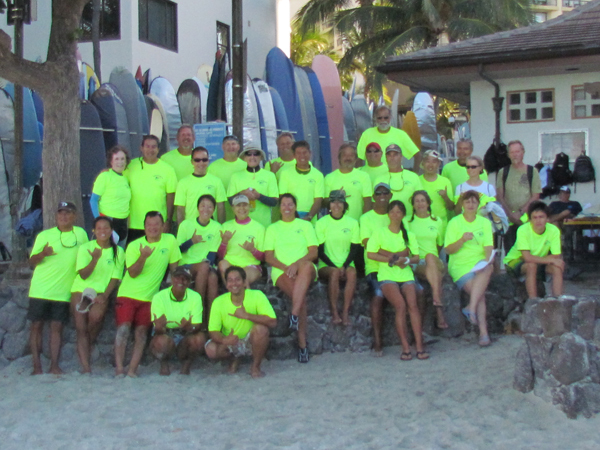 Waikiki Roughwater Swim Committee, Inc. is a not for profit Hawaiian Corporation. Our entry fee is set to recover our direct costs plus a 10 percent contingency fund. The swimmer entry fee is used to pay our annual swim costs. In 2012 we paid $30,000+ for police services, mandatory insurance and permit fees, web services, data base maintenance, advertising, printing and mailing, swim caps, awards, professional water safety services required by the permit process, timing services, equipment rental, communications and sound system services, volunteer tee shirts and race day operations. To put it quite simply, the bills must be paid even if the race isn't held. If for some reason you are unable to race you may, with approval from the race director transfer your entry to another individual. This may only be accomplished in person at late registration on Sunday before the race. How is starting group seeding determined? Waikiki Roughwater Swim seeds swimmers into one of five groups for course and swimmer safety. The race starts at 8:30 AM with the subsequent groups staggered five minutes later at 8:35, 8:40, 8:45 and 8:50. Group A starting at 8:30 AM is reserved for top 100 finishers from the previous year's race and others at the discretion of the Race Director. Seeding assignment for Groups A, B, and C is accomplished on close of normal entry deadline, on TBD. All entries received late or those with no entry time indicated will be assigned group D. Assignment to other starting groups is at the discretion of the Race Director. Fin division swimmers will be seeded in the last group. For entries received prior to August 31, 2019 an email confirmation and pre-race instructions will be emailed to each entrant. If you use mail filters it may end up in your junk mail folder. If no email confirmation is received by August 31, 2019, you may go to the late registration desk to pick up your confirmation card. This card is required to obtain your race chip on race day. If you want confirmation of receipt of entry, look on the website after August 28, 2019. Race numbers, swim caps and timing chips for entrants will be available for pick up at Sans Souci Beach on race day 6:30 AM to 8:30 AM. Out the Kapua (Outrigger Canoe Club) Channel, across Waikiki, and in the Hilton Hawaiian Village Hotel channel. Course will be marked by buoys every few hundred meters. Sans Souci Beach between the Natatorium and the New Otani Kaimana Beach Hotel, Waikiki. There will be staggered starts at 5-minute intervals beginning at 8:30 AM. To reduce crowding at the start, the field will be divided into groups of approximately 150 to 200 people based upon entry times. The fastest swimmers will be in the first group and slower swimmers in the succeeding groups. Late entries may be put into slower groups depending on availability. The race committee reserves the right to place you in any group. If you have been unable to finish in the past or have difficulty swimming 2000 meters you should not enter unless you have significantly improved your swimming ability. If you swam 2018's Waikiki Roughwater Swim, please enter your time (can be found on the 2018 Waikiki Roughwater Swim Official Results Page) in the space provided on the application form. Otherwise enter a 2000 meter swim time (which may be an educated estimate) or no time. Your safety is our most important concern. There will be boats and paddlers on surfboards patrolling the racecourse. Swimmers are responsible for their own physical condition and are encouraged to train adequately and have a physical check-up prior to the swim. Swimmers who have not passed the buoy No. 10 by 10:30 AM will be pulled from the water. All non-finishers will be taken to the beach area of the Hilton Hawaiian Village. Duke Kahanamoku beach in front of the Hilton Hawaiian Village Hotel. Swimmers must cross the finish line, which will be 20-30 meters up the beach from the water’s edge. To be an official finisher, you must complete the race in less than 2 hours and 40 minutes and wear a swim cap during the race and while crossing the finish line. Race day all swimmers will be numbered on legs and arms. You will be disqualified if you are not numbered. Your race number will be emailed to you by August 31, 2019. If you do not have email, race number can be picked up in person at late registration table on September 1st or September 2nd. If you use email filters, the email with your number may end up in your junk mail folder. To ensure fair competition, no personal escorts on surfboards, kayaks or boats are permitted. Competitors must wear the WRS color swim cap they are provided at registration. Men may wear briefs or jammers (waist to knee) and women one or two piece shoulder to hip swim suits. This is a swimming event: flotation devices, fins (except for the fin division), wetsuits, suits that provide any sort of floatation of any kind or any other swimming aides are prohibited. Goggles are strongly recommended. Your entry fee includes a swim cap that MUST be worn during the race. Must be submitted to referee at the finish line within 30 minutes of the swimmer's finish. See entry fee information on the Application Page. Late entries will be accepted from Noon to 3:00 PM Sunday, September 1, 2019 at Boca Hawaii - 330 Cooke Street, Honolulu, Hawaii. Cash or Credit will be accepted. Late entries will be accepted race day between 7:00 AM and 8:00 AM. Race day entry fee is $120. Cash or Credit will be accepted. T-SHIRTS: All T-shirts will be distributed at the finish line. If you do not swim or finish the race, you can still pick up your shirt at the Shirt Table. T-shirt table will close at 1:00 PM. Male & Female: 10&Under, 11-12, 13-14, 15-16, 17-18, 19-24, 25-29, 30-34, 35-39, 40-44, 45-49, 50-54, 55-59, 60-64, 65-69, 70-74, 75-79, etc. Top three overall male and female finishers will be placed in an elite division. Name of the first individual to finish will be engraved on the "Alexander Hume Ford" perpetual trophy. Elite division awards to the top three male and female finishers. Elite division winners will not participate in the age group competition. Awards will be presented to the top three male and female finishers in each division (or 5% of entrants, which ever is greater). The fin division will not utilize age groups and all fin swimmers will start last. Military top finishers will also be presented. Awards ceremony to start at 11:30 AM. Timers will wait for the last official swimmer to finish. Live results will also be posted on Waikikiroughwater.com. Awards will not be mailed or delivered to the winners at the expense of the committee. If you are unable to make the awards ceremony please pick up your award following final posting of results or have a friend pick it up for you.